I’ve been in SEO for about 12 years now, which isn’t FOREVER, but it isn’t nothing! And in that time of trial and error and testing and learning, I have done keyword research a lot of different ways! It used to be that you could get pretty good data from Google AdWords’ Keyword Planner tool as a non-ad-buying user. However, over time, that data has become less and less useful. With short-tail keywords, annoying keyword groupings, and less reliable numbers of searches per month, it wasn’t my favorite tool. Now, Google has announced they’ll start deactivating accounts with no ad spend associated with them. In other words, it will deactivate accounts of the people who only use the Keyword Planner tool without buying ads. Bummer. That’s not to say there are no good tools out there. Actually, if you’re in need of a good keyword research tool, I have really enjoyed using Moz’s Keyword Explorer tool and the Ahrefs keyword tool. You need a paid account to get all the great data it offers, but it’s worth it if you’re doing a lot of keyword research for projects. 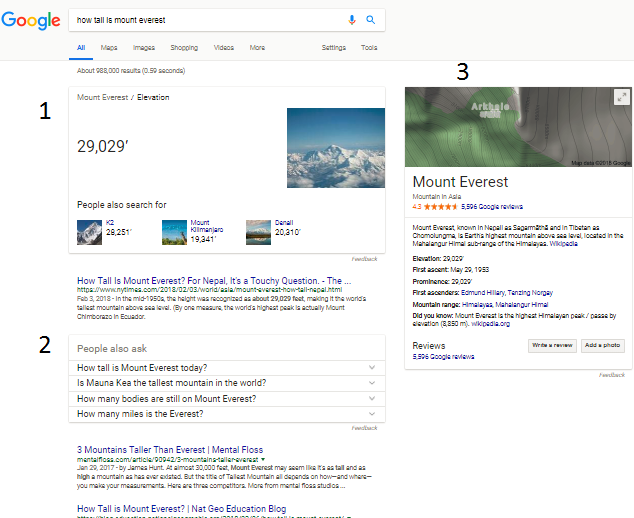 But on to the point of this post: what else should you be doing in addition to using a keyword research tool to get information on how to optimize your pages for users and search engines? A lot! In fact, I rarely use keyword research tools anymore, and when I do, it’s well after I’ve done other research on my own. Of course, every person will have their own preferred methods for research, but here’s what I do. Be sure you understand your topic. When I was freelancing, I found myself needing to write for and optimize a site about surety bonds. I had never in my life thought about bonds and really didn’t know how they worked. Before I started optimizing, I needed to understand the products and the company selling them. Take a little time now so that you don’t have to redo a lot of work later! Check what your competitors are doing. This is probably common sense, but know who you’re up against in the market and what their tactics are. What topics are they covering on their website? Do they have any really cool widgets or graphics that users might love? Research (but not just with a keyword research tool). Do a Google search and see which sites/pages are ranking. How do they talk about your topic? How much content is on the page? What are the title tags of each of the top results? Note the “People Also Ask” questions. Those are based on user queries and are a fantastic way to rank for long-tail questions. Write content that answers those questions thoroughly and specifically. In the image, #1 is a featured snippet. 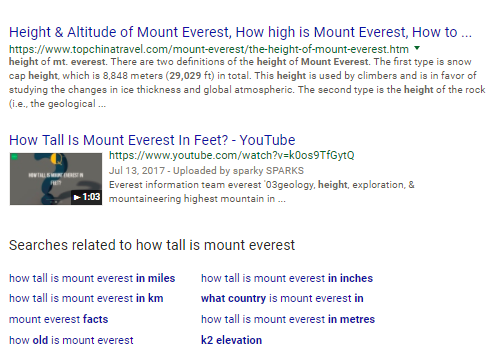 It’s a little bit of information Google provides from its database or scrapes (ahem, “borrows”) from another site to give you an answer right there at the top of the page. 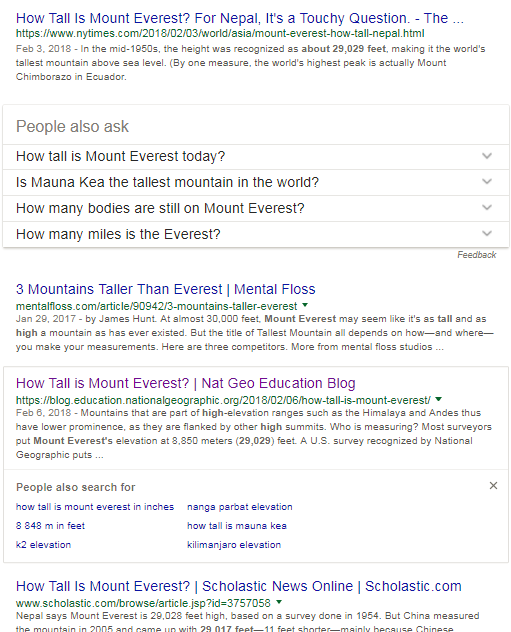 #2 is the “People Also Ask” feature that shows related questions people have for your query. And #3 is called a Knowledge Graph, it provides a quick snapshot of the thing you searched for (try Googling a person, place, or business). Check the “related to…” searches at the bottom of the search results page. These can be a treasure trove of long-tail related topics you might want to write content about or optimize for. Click on one to see the results for that search query, and then scroll to the bottom again to see even MORE related searches. Look at the “People Also Search For” feature. Isn’t that what you just said in point three, Laura? No! This is different. The way it works is you click on one of the organic results and then click back to the search results page. When you do, a small box appears below the result you clicked on with even more related searches. In the image below, I clicked on the National Geographic blog link and then clicked back. Google wants to help me refine or expand my search. Note all these topics are content/optimization possibilities. Use a keyword suggestion tool like Answer the Public. I’ve talked about this tool before because I really like it for a lot of the work I do! It’s great for finding long-tail questions about any topic in a variety of languages. 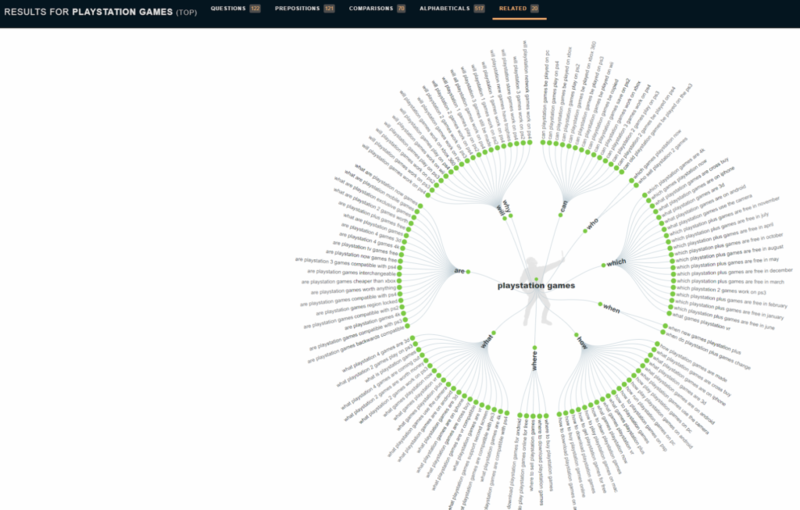 NOW, go use a keyword research tool. It may seem strange to wait until this point to go use a keyword research tool to find data about search volume, but only at this point do you have a good understanding of the long-tail queries pertaining to your topic. Be prepared to see very little in the way of search volume. That’s fine! It’s much better to go after long-tail, low-competition keywords than short-tail, high-competition keywords. They have a higher conversion rate and are much more realistic to rank for. In practical terms, that means don’t try to rank for “Atlanta hotels.” There’s too much competition, and the person searching for that isn’t ready to purchase. They’re very high up in the sales funnel. Instead, optimize for the person looking for a “pet friendly Little Five Points hotel near The Vortex.” I guarantee there is no search data for that phrase, but I bet you can rank for it much more easily. And now, you’re optimizing for a person ready to buy! But how do you know which terms to choose if there is no listed search volume for any of them? You choose the ones that most support what your page should be about. If you’re a boutique hotel in Midtown Atlanta overlooking Piedmont Park, then write the homepage content to support that fact. Don’t mention that you have 10 meeting rooms and fancy soap. Save that for the pages about those specific things. No one is searching Google for that, and it has nothing to do with what you’re “about.” You’re about being across the street from the park entrance, a 20-minute walk to the MARTA station, one block from the best coffee shop in the area and within two miles of the Fox Theatre, High Museum, and the best Southern food in town (get specific!). I hope this alternative way of doing keyword research helps! I’d love to know if you already do these things or if you plan to try them. Let me know in the comments! If you’d like to consult with us about your SEO strategy, email us at [email protected].